As of 1st of March 2017 Fishers Barbershop will be an appointment only business. We are giving all our clients 4 months notice and believe the new appointment system will give a better customer experience to you all. You will be able to use our (free) app to book an appointment which is available on all Android and iPhone smart phones and you can also call the shop to book an appointment on 01473 713100. If you do turn up without an appointment I will do my best to accommodate you. I look forward to this new venture for Fishers Barbershop and I appreciate all your feedback and support. 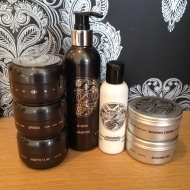 Fishers barbershop is an appointment salon offering barbering and mens hairdressing. 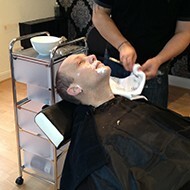 At fishers barbershop we try and give a more personal customer service. Fisher’s Barbershop can offer traditional cut throat shaving, with optional hot and cold towel treatments for that special occasion or treat. As well as providing modern haircuts, trims, styling, colouring and highlights to adults and children. Barber Ross Fisher boasts over 15 years hairdressing experience and has a wide range of skills in both modern and traditional barbering techniques. The salon also features off street car parking to the rear of the shop for your convenience.